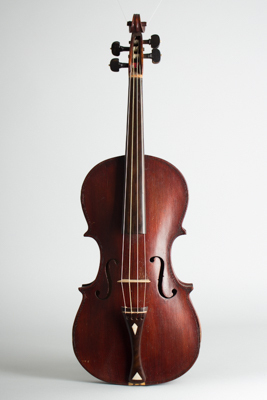 19th Century New England Model Folk Fiddle (maker unknown). Unusual 19th century folk violin from New England. Delicately carved scroll. Tailpiece with geometric bone inlay. Overall length is 23 in. (58.4 cm. ), 8 in. (20.3 cm.) wide at lower bout, and 1 3/8 in. (3.5 cm.) in depth at side, taken at the end block. Scale length is in. (0 mm.). Very Good Condition.